The Biofinity® toric range is now 540% larger! +10.00D to -10.00D (sphere) and to -5.75 (cylinder)—that’s 7 new cylinder powers! Now, for the first time, even your astigmatic patients with high refractive errors can wear silicone hydrogel, monthly contact lenses with the proven CooperVision® Biofinity® design. Biofinity XR toric lenses allow your practice to offer the reliable comfort, clarity and stable fit* of Biofinity toric lenses to more patients. Hydrogel lens wearers can now upgrade to silicone hydrogel, a healthier, more advanced lens material. Custom lens wearers can switch with confidence. Biofinity lenses are known and respected for their consistent vision correction, optimised fit* and excellent value. “Spectacles only” wearers who haven’t been able to wear contact lenses, or have had challenges with other brands, can finally experience the proven comfort and clarity* of Biofinity thanks to our XR toric range. Biofinity thanks to our XR toric range. Breathability. High oxygen transmissibility helps maintain clear, white eyes and healthier corneal physiology. Natural and uniform wettability. Retains water naturally without additives, surface treatments or wetting agents. Flexibility. Optimum modulus for a soft and flexible lens. 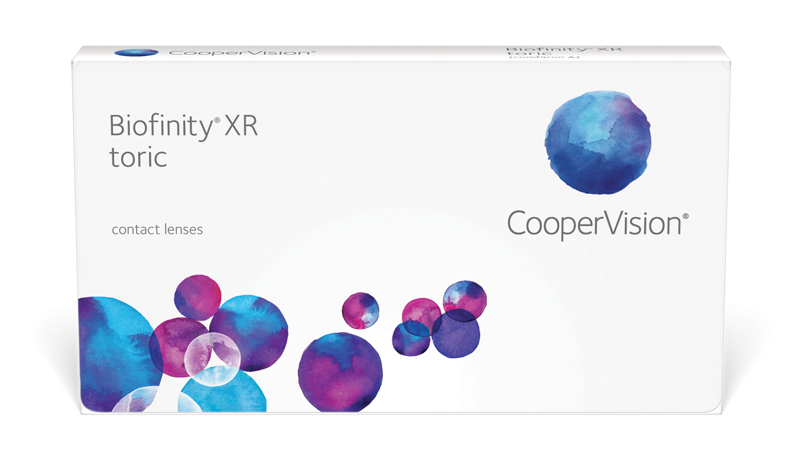 Contact your CooperVision Business Development Manager to learn more about Biofinity XR toric and the entire Biofinity family. Creates an optimised balance of high oxygen permeability, good water content and optimum modulus to provide increased breathability and moisture in a soft, flexible lens. It creates a naturally hydrophilic silicone hydrogel lens with optimum modulus that is highly breathable, so your patients can enjoy a healthy, more comfortable, lens-wearing experience.